Medical Center Hospital (MCH) Center for Women and Infants in Odessa, Texas is being built to provide a hospitality experience for their mother and baby patients, as well as the family members. Medical Center Health System teamed up with their architects, highly specialized staff at this facility and even the public to create one of the most state-of-the-art maternity centers in this region. The MCH Center for Women and Infants is being constructed as an extension to the existing hospital. The architecture on the exterior had to blend with the existing but give the facility a splash of modern style. The interior had to appeal to a person of any culture, age or socio-economic status. The interior walls and columns are clad with metal in the lobby areas on all three floors, giving the lobby areas a sleek contemporary look that acts like a piece of art. 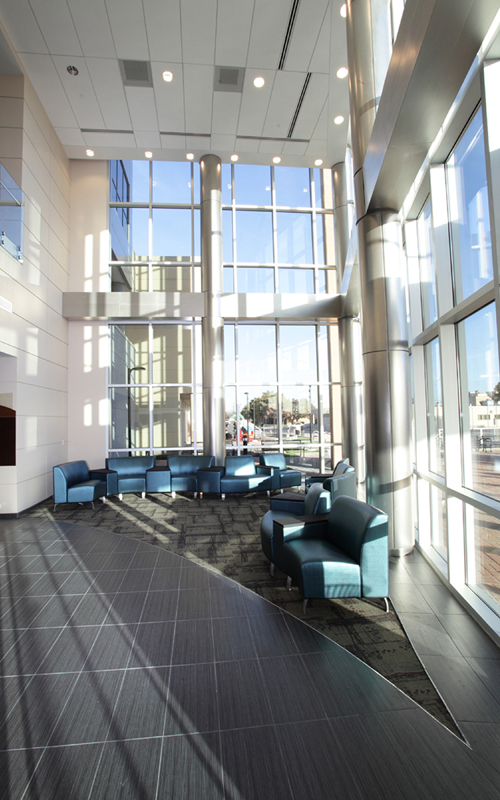 Natural light in patient rooms and lobby areas. The design intent is appealing to two different patient populations, the mother and baby. Baby represented by a crochet blanket and the mother represented by lace. Both offer different textures but the uses of organic structure designs coupled with bringing the exterior architectural elements to the interior are all reflected throughout the design. The finishes reflect a hospitality look filled with warm neutral tones, all while they are durable and suitable for a healthcare setting. The furniture in the public spaces features serpentine and lounge style seating. With the clients’ appreciation for evidence-based design, the artwork desired is feminine macro-photography displaying flowers and plants with other organic elements.